Proving Ground is a razor sharp, fast-paced New York City procedural and a fantastic return to form for Blauner, who hasn't had a book out in 10 years. When a high profile defense attorney is shot in an apparent car robbery, both the victims family and Detective Lourdes Robles suspect foul play. Complicating matters is the victims son, an Iraqi war vet with demons of his own. Blauner has a great ear for dialogue and character: Blauner's New York is vividly drawn with darkness and humor. The plot twists and turns, moving us effortlessly to the conclusion. Perfect for fans of Connelly, Coleman, and Lehane. Proving Ground, New York Times bestseller and Edgar Award winner Peter Blauner’s first novel in more than a decade, is a sweeping crime novel, an intricate story about the quest for redemption, and a vibrant portrait of contemporary New York City, all told in Blauner’s singular voice. Nathaniel Dresden never really got along with his father, an infamous civil rights lawyer who defended criminals and spearheaded protest movements. As an act of rebellion, Natty joined the U.S. Army and served in Iraq, coming back with a chest full of commendations and a head full of disturbing memories. But when his father is found murdered near the peaceful confines of Brooklyn’s Prospect Park, Natty is forced to deal with the troubled legacy of their unresolved relationship. He also has to fend off the growing suspicions of NYPD Detective Lourdes Robles, a brash Latina cop with something to prove, who thinks Natty might bear some responsibility for his father’s death. Though truth be told, the list of people—cops and criminals—who wanted David Dresden out of the way is long. The search for answers leads Natty and Lourdes into an urban labyrinth where they must confront each other—and the brutal truths that could destroy them both. 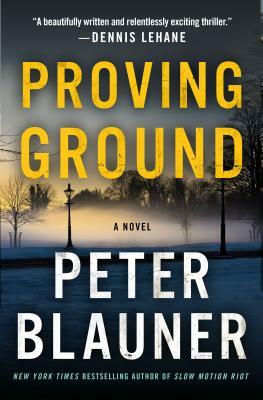 "Peter Blauner’s new novel, Proving Ground, is an old-school page-turner, as war-damaged army vet Nathaniel 'Natty Dread' Dresden and police detective Lourdes Robles close in on the killer of Natty’s father…and, maybe, each other. Taut narration, spot-on dialogue, and sharply etched action sequences make this one a must read.